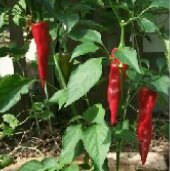 Mirasol is the name of the fresh pepper and Guajillo is what the dried form is called. This Mexican native has a fruity flavor with a berry hint and is used in mole sauce. The 3-6 inch long fruit ripens to a deep burgundy and can have red to reddish-orange tones. The skin is a bit tough but smooth in texture. Compared to the Habanero (215,000 Scovilles) this pepper is relatively mild rating 2,500 to 5,000 Scovilles. Mirasol peppers sometimes grow pointing up which is where they get their name. Mirasol means “looking at the sun” in Spanish. They are the second most popular chile in Mexico coming in behind Ancho. Outstanding Features: Also called chile Trompa or Elephant’s Trunk.